Posted on 23 Oct 2014, 12:17 pm, by admin, under Car, Computing, Electronics. There are many devices which are designed to plug into a car’s auxiliary socket (formerly known as the cigarette lighter socket) which, ideally, depend upon the voltage turning off with the ignition. One such device, which I’ve recently fitted to my own car, is a dashcam. Luckily, the power to my car’s auxiliary socket is switched with the ignition but there are a lot of cars in which the power isn’t switched with the ignition. I’ve spotted one or two dashcams which can automatically sense if the engine is running but they tend to be very top of the range devices costing £150++. 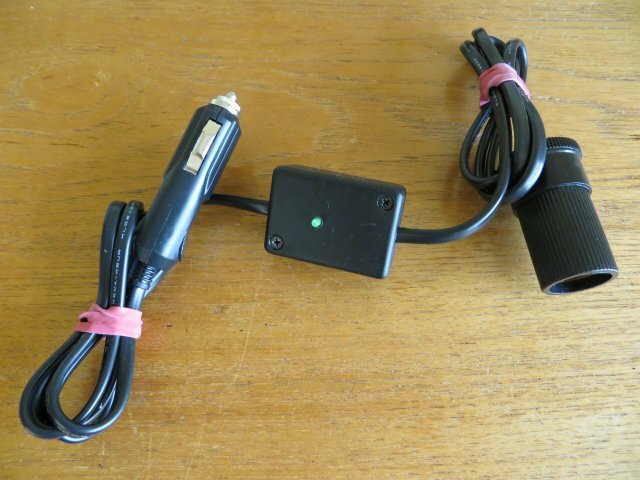 For the rest of us, it’s inconvenient to keep plugging in and un-plugging the dashcam’s power lead at the start and end of each journey (or fitting some sort of switch) and, in any event, is likely to be forgotten just when it’s needed! This project is designed to monitor the battery’s voltage to determine whether the engine is running or not. It plugs into the auxiliary socket at the “front end” and has it’s own switched auxiliary socket at the “rear end”. I’ve only been able to find one commercially-available product which does the same and, in my opinion, it seems a bit expensive. Depending on what you already have in your spares box, this project should cost about a third of its commercial counterpart. « Another HVDC Cable boat shot.